What would happen if your specialised expertise and knowledge – that clients and customers value highly – was available to everybody instantly and at a fraction of the cost? That disruption is happening right now, across a range of industries. You become the “go to guy/gal” in your organisation for your expertise. You guide your own career path. Your work becomes more meaningful and rewarding. Decision-making becomes easier, because you use your personal brand as a guide. 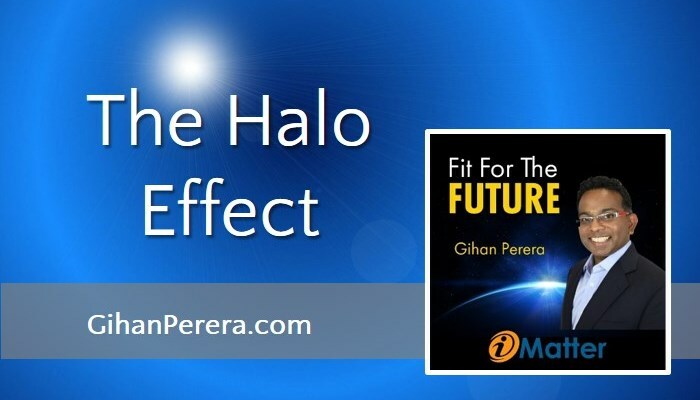 You attract and retain the best people (those aligned with, and inspired by, your brand). It’s easier to approach people outside your organisation for help. You become a role model for team members who want to build their own personal brand. Your personal brand is not based on a logo, clever slogan, or your personality. It’s based on two things: your expertise and your network. In other words, it’s about what you know and who you know. As a leader, you already have expertise, knowledge and insights that others value. By sharing it, you help others and build your own credibility. Leaving aside your role as their manager, what else do your team members ask you about? What do peers and colleagues ask you about (again outside your formal role in the organisation)? Do you have an external profile – say, with the media or public? Are you passionate about something in your industry? Are you passionate about something related to your role (for example, marketing, customer service, or finance)? Are you passionate about something related to your work as a manager or leader (leadership, teamwork, talent retention, or goal setting)? Are you passionate about some other aspect of your professional life (networking or media relations)? 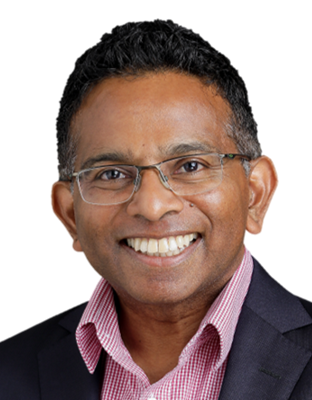 Are you passionate about something bigger than your organisation but related to it (corporate social responsibility, climate change, Generation Y in the workplace, working away from a traditional office, female leaders, or outsourcing)? Although it’s important to know your expertise, this isn’t essential for everything else. Even if you’re not sure of your expertise yet, accept whatever feels right now. For some people, this is a lifelong journey, so start the journey anyway. In a crowded marketplace where sales meetings are getting shorter and buying cycles are getting longer, it’s becoming more difficult to cut through the clutter and sell with impact. 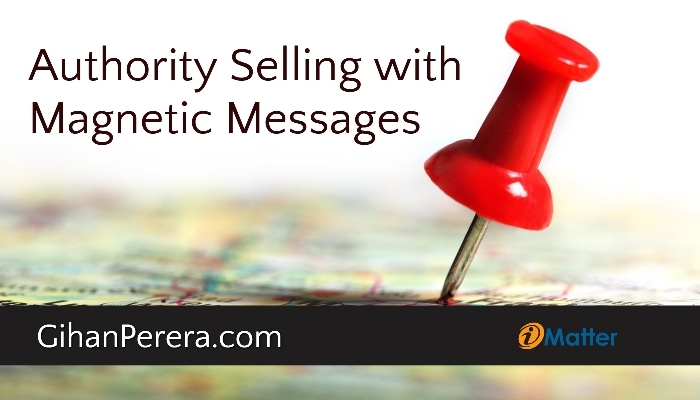 In this webinar, I’ll show you how to use the power of magnetic messages to cut through the clutter and deliver a clear value message to prospective clients. 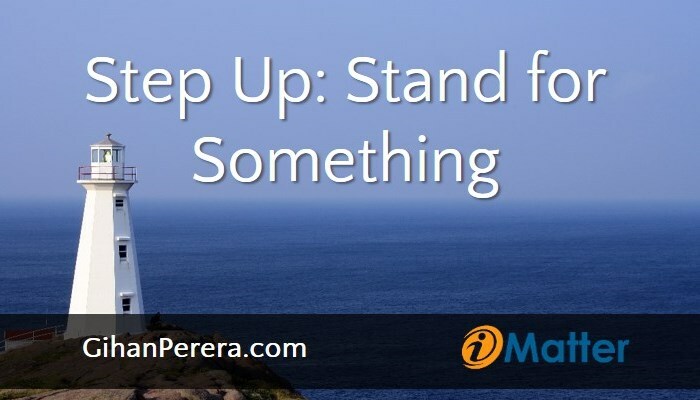 Great leaders aren’t afraid to stand for something that matters to them, even if it means being unpopular. They have a strong personal brand based on what they stand for, and built on two things: their expertise (what they know) and their network (who they know). That personal brand drives their decision-making, attracts the best followers, and makes a mark in their world. 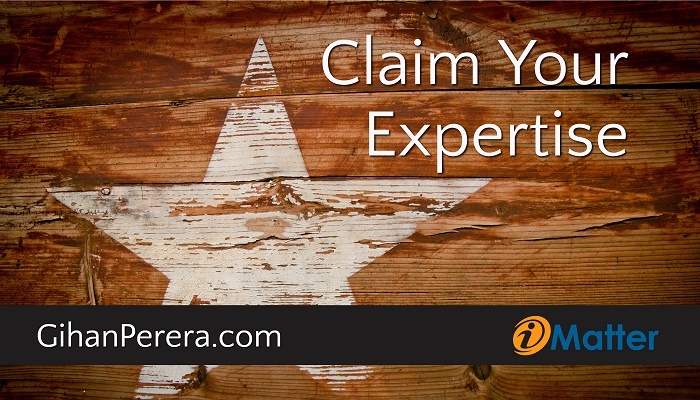 Claim Your Expertise: To establish your authority, put a stake in the ground and stand for something. Even if you’re not sure of your expertise yet, accept whatever feels right now. For some people, this is a lifelong journey, so start the journey anyway. Build a Network of Connections: Build a strong network, both offline and online, and both internal and external. Start with LinkedIn, Twitter and your industry forums. Consume High-Quality Material: Instead of feeling overwhelmed by information overload, see it as an opportunity to learn from many sources. The key now is to learn from trusted sources in your network, rather than relying only on mass media or broad Google searches. Comment with Value: Commenting online is easy, but most people just make shallow comments. 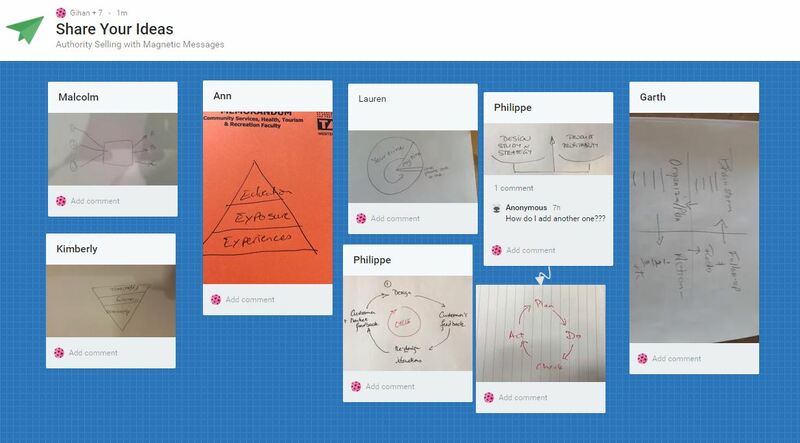 Instead, make meaningful comments that add value to the conversation already taking place. Curate Other People’s Material: Sift through all the material that comes your way, and carefully choose what to share with your network. One of my clients, Kirsten Hodgson, describes it as “doing their reading for them”. Create Original Material: Finally, you can publish your own ideas, stories, examples, research, and insights. 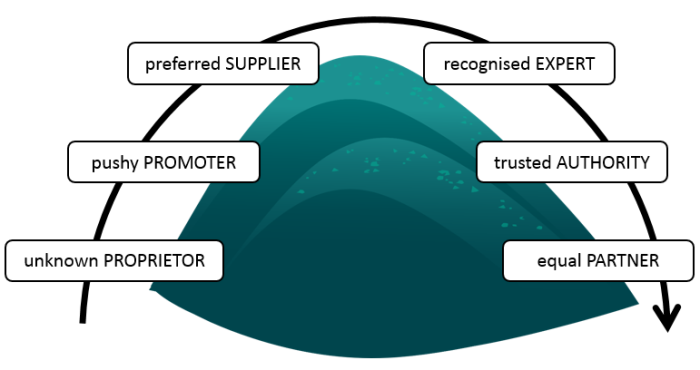 Are you a pushy promoter, a preferred supplier, a recognised expert, or a trusted authority? 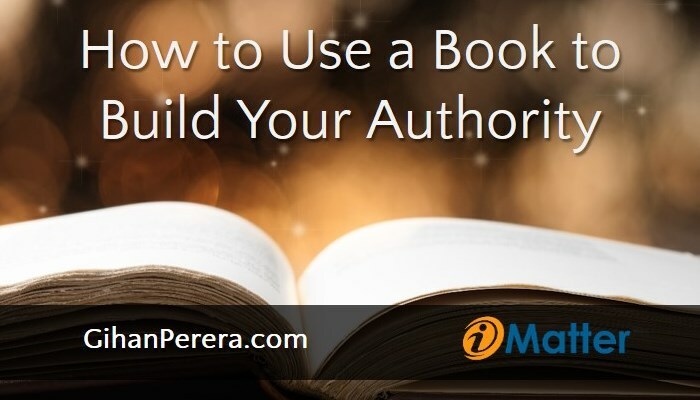 In this webinar, I show you how to leverage a published book to build your authority and attract business rather than chasing it. 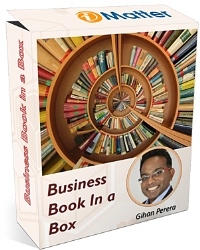 You might already know about my Business Book in a Box service, where we take the ideas in your head and write a book for you. 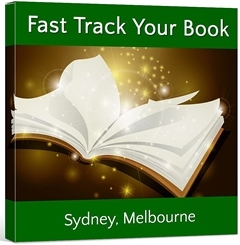 If you’re happy to do the writing yourself, but don’t know how to turn it into a book, you might be interested in my new “Fast Track Your Book” Masterclasses, coming up soon in Sydney and Melbourne. This is a one-day program to teach you the process of writing a book – including structure, layout, cover design, ISBN, barcodes, illustrations, and access to all the suppliers I use myself. You’ll walk out with a detailed outline of the book, the knowledge of how to fill in the content, and a realistic action plan for getting it done. Your positioning in your marketplace – how your ideal customers and clients view their relationship with you – has a huge impact on your success. If you have low-level positioning, you’re constantly pushing hard to get noticed and get picked. But if you’re positioned as an expert, authority, or partner, the right customers and clients are magnetically attracted to you. In Australia, it’s the start of a new financial year, and many businesses are setting goals and plans for the new year. It’s a challenging time in business, with a lot of uncertainty – including our recent Federal election in Australia, the Brexit vote in the United Kingdom, and a presidential election in the USA later in the year. But these are all external factors, and we can’t control them. So, important as they are, if you’re setting plans for the new financial year, put those issues aside for the moment and focus on what you can control. If you’re thinking of launching a new product or service this financial year, your positioning in your marketplace makes a huge difference to your success. If you already have a strong position, congratulations – you have a head start. If you don’t, it’s not a disaster, but I suggest you work on your positioning first, so that everything else becomes easier. When I say “positioning”, I’m talking about how your ideal customers and clients view their relationship with you. This is not the same as your brand, although it’s related. It’s about the relationship you have with them. For example, I remember my parents telling me that when they went to school, their teachers were seen as authorities, and anything they said was taken as true without question. So they were surprised to hear that one of my teachers encouraged us to be sceptical, curious, and even openly challenge him. Now, with so many other opportunities for learning outside school, the idea of “teacher as authority” has been whittled down even further. That’s what I mean by positioning. Each teacher might have had their own “brand” (style) of teaching, but also had the positioning of “trusted authority” for their students. What is YOUR positioning with your market? Proprietor: This is the lowest level, where you’re just a business owner. Your market might not even know you exist. Or, if you’re launching a new product or service to an existing market, they might not know it exists. Either way, you’re pretty much unknown. 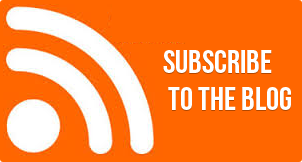 Promoter: At the next level, you actively promote the product, so your market knows about it. But you’re just one of many promoters in their face, so it’s not easy to get noticed, and even harder to get picked. Even though you have something of value, you’re still considered pushy. Supplier: When you do get picked, you become a supplier. Assuming you do a good job, you become their preferred supplier, and will continue to get work. Expert: Even if you’re a preferred supplier, you might lose work when somebody better comes along or your customer’s circumstances change. That’s why it’s better to be positioned as an expert, where you’re recognised as somebody who works with your clients, not just for them. Authority: Five years ago, expertise used to be enough. But now that so much expert information is available online, you can be displaced by another expert. The next level is to be an authority, where you’re trusted to provide advice, not just share expertise. Partner: Finally, you can reach the level of partner, where you genuinely work side by side with your customers and clients as their equals. Just as with life partners or (formal) business partners, your customers see you as equal to them. There’s nothing wrong with any of these levels, but the higher the level, the more leverage you have. The first three levels – proprietor, promoter, and supplier – are the weakest, where you have to work harder to get business. They are “push” levels, because you’re constantly pushing yourself (and your products and services) to your market. Even when you’re a supplier, you have to keep working at the relationship to ensure you don’t get crowded out by somebody else. The other three levels – expert, authority, and partner – are more powerful, because the business starts coming to you. 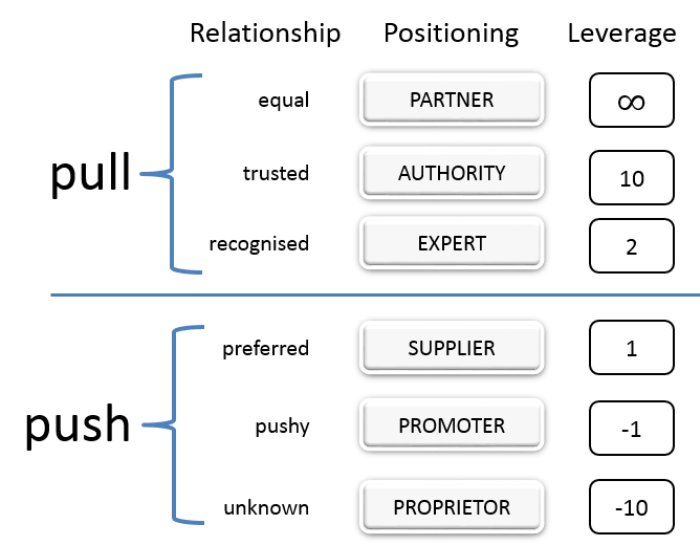 They are “pull” levels, because your positioning naturally attracts people to you. Think of it like rolling a boulder over a steep hill: It starts off as a hard slog, gets a bit easier as you gain momentum to reach the peak, then the downhill ride is much easier, and it gets easier and easier as gravity builds even more momentum on the other side. Where do you fit right now? Your positioning changes over time, because it depends on three things: You, your product/service, and your market. 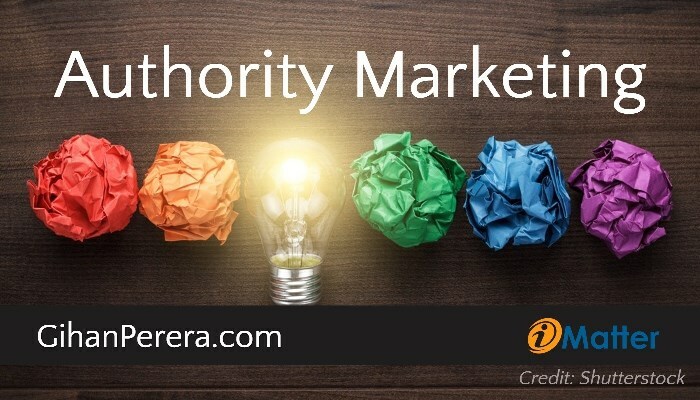 You might already be a trusted authority with one product in one market, but when you switch to a different market or a different product, you go right back to being an unknown proprietor. So think about a new product or service you’re planning for this financial year, and ask yourself (honestly) about your positioning. If you’re not already at the top three levels – expert, authority, or partner – start working on that right now! As markets become more competitive and customers have more options than ever before, it’s essential to stand out from the crowd. Advertising doesn’t work anymore, unless you have very deep pockets. Instead, learn how to build credibility and establish yourself as an authority. 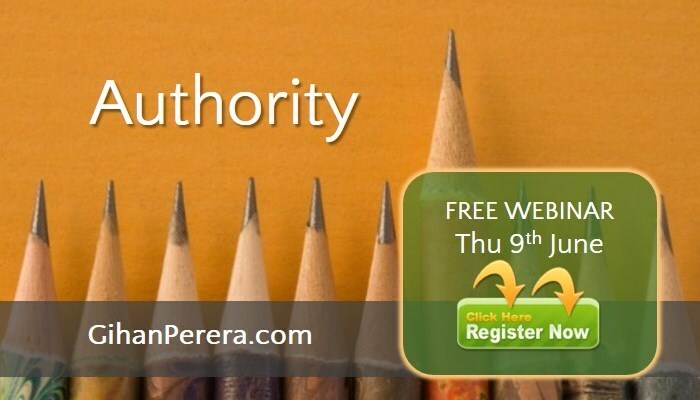 Want To Write Your Own Authority Book? What would it mean for you and your business to be the author of a book? It doesn’t take years anymore! You can be a professionally published author in months – with just a couple of days’ effort on your part. In our increasingly online world, where people communicate using 140-character tweets and Instagram photos, the humble book is still one of the best ways to show your authority as an expert. In fact, it’s become even more powerful now, because it shows you have put the time and thinking into creating something so valuable. Our society places a high value on authors. 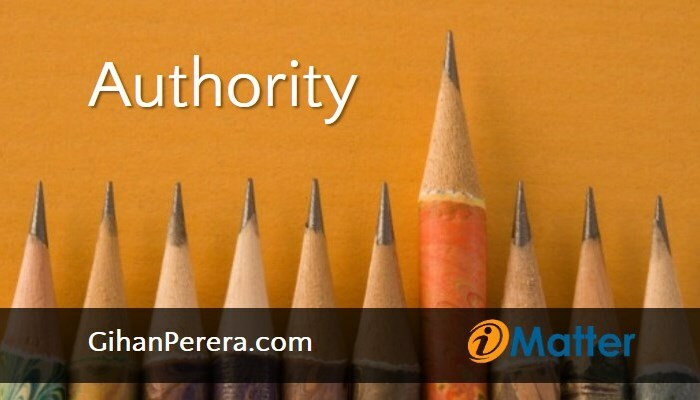 Being an author gives you instant credibility and positions you as an authority (It’s no coincidence the word “authority” starts with “author”). This means that – all other things being equal – your potential clients and customers are more likely to choose you because you’re an author. Even if all other things aren’t equal, they might still choose you because you’re an author. Send it to key prospects as the initial contact. Give it to prospects at a sales meeting. Send it to long-term clients as a thank-you gift for their loyalty. Ask clients to give a copy to somebody they might refer to you. Send it to key influencers who refer business to you. A book boosts your reputation, and puts you ahead of your peers and colleagues. If you’re a Millennial looking for financial advice, would you rather talk to just any financial adviser or one who has written the book on wealth creation for Millennials? Your book boosts your reputation with the media as well. You can become the person the media call for an expert opinion, and you can even leverage your reputation into regular media appearances (such as a radio show or newspaper column). It also helps you get speaking engagements. Conference organisers like to know they are engaging experts, and your book demonstrates your expertise. You’ll be invited to speak at more conferences and sit on more panels, and this boosts your authority even further. It isn’t easy to write a bestselling book. And it isn’t easy to get the attention of a publisher. But you don’t need either of those things now. You can write and publish your own book about your area of expertise, and then give it away as a marketing tool that demonstrates your authority. That doesn’t mean it’s easy. It’s not! But that’s OK. In fact, it’s good – because if you’re willing to put in the work, you’ll be way, way ahead of your competitors. The good news is that it really is possible now – and in a cost-effective way. In the past, it wasn’t feasible to print just a few hundred books, because printing was expensive. In the past, you needed to pay a lot of money to convert the basic manuscript into a finished product. In the past, you paid a lot of money for design, typesetting, layout and other technical work. All of that has changed now. There are many freelancers who can help with the technical work, printing isn’t expensive anymore, and being a published author is now within the reach of more people. You can even use services like my Business Book in a Box process to do the heavy lifting of the writing, design, typesetting, layout, and finishing. The key thing is that your customers and clients still recognise the value of a printed book. 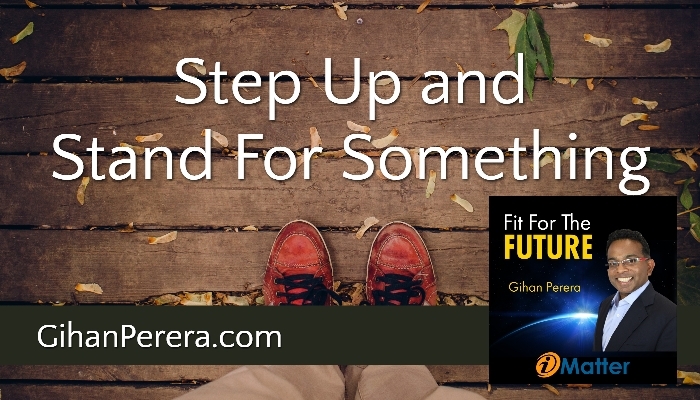 Because you’re writing this book as a marketing tool, you will self-publish it. That means that you’re not trying to get a book deal with a publisher (that takes too long for your marketing needs, anyway). Instead, you will write the book, polish it until it’s ready to print, and then pay for a printer to print it. Because this is a marketing tool, you will probably give away most of the books you print. You will give some to prospects, some to clients (as gifts or to pass on to other people), some to key influencers, and even some to the media. In other words, you’re not trying to make money from the book – but you will make money through it.